The River is a 1938 short documentary film which shows the importance of the Mississippi River to the United States, and how farming and timber practices had caused topsoil to be swept down the river and into the Gulf of Mexico, leading to catastrophic floods and impoverishing farmers. It ends by briefly describing how the Tennessee Valley Authority project was beginning to reverse these problems. 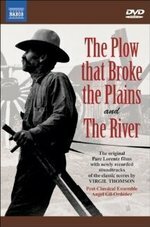 It was written and directed by Pare Lorentz and, like Lorentz's earlier documentary The Plow That Broke the Plains, was also selected for preservation in the United States National Film Registry by the Library of Congress as being "culturally, historically, or aesthetically significant", going into the registry in 1990. The film won the "best documentary" category at the 1938 Venice International Film Festival. Both films have notable scores by Virgil Thomson that are still heard as concert suites. The film was narrated by the American baritone Thomas Hardie Chalmers. Thomson's score also references his concert work Symphony on a Hymn Tune. The River later served as the score for the 1983 TV movie The Day After. The two films were sponsored by the U.S. government and specifically the Resettlement Administration (RA) to raise awareness about the New Deal. The RA was folded into the Farm Security Administration in 1937, so The River was officially an FSA production. There is also a companion book, The River The text was nominated for the Pulitzer Prize in poetry in that year.